Compathos launched their new membership site Compathos>IMERSIV Earth Week 2016, with the VOD-stream of This Changes Everything during the week followed by an online discussion with Dr. Reese Halter and David Witzel on Earth Day. The event was co-hosted by the Charter of Compassion Earth Week Program. All around the world, people are hosting screenings of this powerful new film in living rooms, libraries, and independent theaters. Filmed over 211 shoot days in nine countries and five continents over four years, This Changes Everything epically re-imagines the vast challenge of climate change. 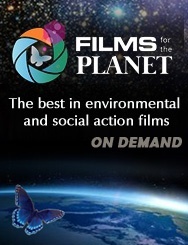 Discussion topics followed the film's narrative and included - unearthing our hearts for nature, advancing climate as the peoples' movement and fostering the emergence of a regenerative economy. Compathos>IMERSIV Digital Theater Collection provides an ad-free viewing environment with access to streaming content in partnership with Vimeo Publisher Platform. The VOD Publisher Network allows viewers to rent or buy titles directly on a publisher's site through Vimeo's transactional video player. Videos can then be watched on any connected device. Publishing partners choose from more than 50,000 videos currently available on Vimeo's VOD library. Of those 50,000 we carefully curate acclaimed cinematic releases, series, and high-quality content for cultural creatives and conscious consumers who are interested in personal health and spiritual transformation, sustainable lifestyles, travel and global citizenry, climate change, visionary culture, planetary thinking and cosmology, and social, environmental and economic justice. Curated online film viewing experiences offer a unique opportunity for social immersion. The individual is exposed to massive quantities of information daily and rarely has the capacity as one person to not only deal with the complexities presented in that information but to act in an informed and productive way. That person may have become more knowledgeable on a topic but how has the world really changed? Joining with like-minded groups of individuals who decide to take collection action not only breaks up the necessary tasks at hand per each person's strengths and interests, it also adds a sense of purpose and direction to each person's life while opening up resources, strengthening ties and building community. Members have access to the streaming collection as well as to downloadable resources for community engagement through film and community storytelling - starting with a Community Engagement Toolkit #1. Filmmaker resources such as the "Digital Distribution Strategy for Filmmakers"re being made available as well as upcoming Director interviews, webinars and Curated Collections. Good stories should plant seeds - seeds that inform our thinking, inspire purpose and ignite actionable outcomes. For us it's always been about Pathos - the story that evokes emotion and moves the viewer to compassion and to action. It's been about the stories that awaken, that affect deep personal and cultural shift, stories that create impact, and stories that give back.